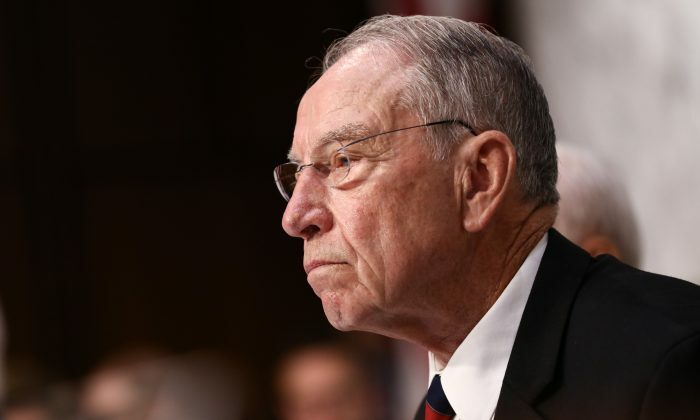 Sen. Chuck Grassley (R-Iowa) is seeking answers from the FBI director and the Justice Department’s Inspector General (IG) regarding the FBI raid of a whistleblower’s home. The FBI raided the residence of Dennis Nathan Cain on Nov. 19, and seized documents related to the Clinton Foundation and the Uranium One deal. Cain had previously provided the documents to an official from the IG’s office, The Daily Caller reported on Nov. 30. Grassley’s Nov. 30 letter to FBI Director Christopher Wray included questions about what the FBI knew about Cain handing over the documents to the IG, why the raid was conducted, and whether the documents were classified. Cain, who had worked for an FBI contractor, discovered documents that indicated that Robert Mueller, then-FBI director and now special counsel in the Russia probe, failed to investigate potential criminal activity of former Secretary of State Hillary Clinton, the Clinton Foundation, and Rosatom—the Russian state company that obtained about one-fifth of the U.S. uranium reserves by purchasing the Uranium One company in 2010, The Daily Caller learned from an unspecified document. Pollock said he didn’t know who Cain’s contractor was, but that Cain’s background checked out. “We are convinced by examining federal documents that he was a bonafide contract employee of the FBI,” he said. Cain has a top-level security clearance and maintains a number of security-related credentials, according to his resume, which has since been deleted online. The trouble is, no one seems willing to confirm Cain’s story on record. The IG’s office provided the documents to House and Senate Intelligence committees, according to Pollock. But the IG’s office declined to comment, as well as the offices of both committees chairs—Rep. Devin Nunes (R-Calif.) and Sen. Richard Burr (R-N.C.). The FBI only vaguely confirmed that it indeed took some action in Cain’s hometown on the day in question. “It was the FBI Baltimore Field Office that did court-authorized law enforcement activity on Nov. 19 in the Union Bridge area,” Dave Fitz, public affairs specialist for the FBI Baltimore Field Office told The Epoch Times. A user who self-identified as Nate Cain, the whistleblower, emerged on Twitter in October. He posted on Dec. 1 that he would appear on Fox News’ Sean Hannity show on Dec. 3. But he wasn’t among Hannity’s guests that night. The Twitter user confirmed to The Epoch Times that he’s indeed the whistleblower, but directed further inquiries to his lawyer, Michael Socarras, who declined to comment. A Fox News spokesperson also declined to comment. The raid, however, was confirmed by Cain’s sister-in-law, Gracie West, a self-described ex-feminist who regularly posts commentary videos on YouTube, including videos from the Oct. 27 #WalkAway March in Washington, where she was accompanied by a man matching Cain’s Twitter profile photo, video footage shows. “My sister calls me at 3 a.m. like about a week and a half ago and says, ‘Grace, pray. The FBI is raiding our house right now,’” she said in a Nov. 30 video. Cain indeed used to work for the FBI, she said. “I knew he left not happy because he was willing to take a job that was a pay cut of $40,000 a year,” she said. According to Pollock, 16 agents raided the house for six hours with a warrant in hand signed Nov. 15 by federal magistrate Judge Stephanie Gallagher in Baltimore. The agents seemed surprised to learn that Cain was a whistleblower. They took his work computer and his phone, West said. Socarras pointed out that the FBI behaved in a way he considered misconduct. He also suggested the FBI wasn’t forthright with the judge. “I cannot believe the Bureau informed the federal magistrate who approved the search warrant that they wanted to search the home of an FBI whistleblower to seize the information that he confidentially disclosed to the IG and Congress,” Socarras said. For her part, West vouched for Cain’s integrity. “He’s a vet, he’s a patriot. He cares more about justice and the integrity of our government more than his own well-being,” she said. She didn’t respond to requests for comment. The Uranium One scandal is a sensitive one for the Clintons. Millions of dollars flew to their foundation while the State Department and other agencies in the Obama administration approved the Uranium One acquisition by Russia. Former President Bill Clinton gave a speech in Moscow months before the deal and was paid $500,000 for it by Renaissance Capital, an investment firm with an interest in the Uranium One deal and ties to Russian President Vladimir Putin. At the time, the Mueller-led FBI was aware that Russian authorities had staged a large-scale operation to blackmail and extort U.S. companies connected to uranium production and transportation. The agency had a source working in the uranium industry that provided evidence of bribery and corruption. The investigation was killed in 2015 by Mueller’s successor, James Comey. If confirmed, Cain’s allegations would turn the tables on Mueller. As special counsel, Mueller was appointed to probe whether the presidential campaign of Donald Trump colluded with the Russian government to influence the election. While Mueller is yet to substantiate such allegations after an 18-month probe, Cain’s story suggests he turned a blind eye to the Clintons’ potentially criminal collusion with the Russian government. In a Nov. 30 letter to the IG, Grassley asked for the Cain documents and an explanation on what the IG intends to do regarding the raid of Cain’s home. He requested a response by Dec. 12. Grassley’s office didn’t respond to a request for further information. Correction: A previous version of this report incorrectly stated when Dennis Nathan Cain emerged on Twitter. Twitter indicates the @cain_nate account was set up in October 2018. A previous version of this report also incorrectly stated when Rosatom acquired Uranium one. It was in 2010. The Epoch Times regrets the errors. Update: The report was updated to clarify known facts about Dennis Nathan Cain’s Twitter account and his lack of appearance on “The Sean Hannity Show” on Dec. 3. The report was also updated with responses from Dennis Nathan Cain, Michael Socarras, and a Fox News spokesperson.